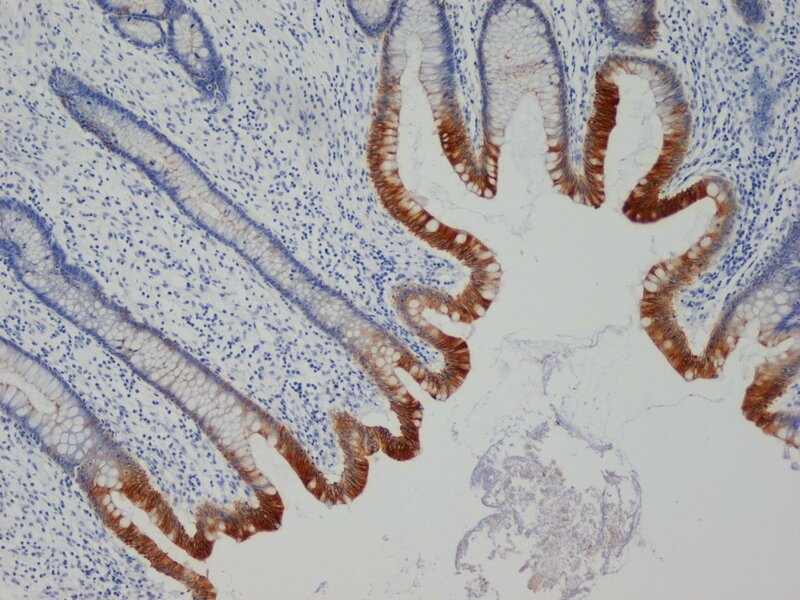 Staining of paraffin embedded human appendix with Mouse anti Human cytokeratin 19 (5552-9009). Western blot analysis of A549 human alveolar adenocarcinoma whole cell lysate probed with Mouse anti Human cytokeratin 19 antibody (5552-9009) followed by HRP conjugated Goat anti Mouse IgG, visualized by chemiluminescence. Mouse antiHuman cytokeratin 19 antibody, clone A53-B/A2 (5552-9009) used for the identification of CK19 expressing cells and tissues by immunohistochemistry and immunofluorescence. From: Johnston RL, Wockner L, McCart Reed AE, Wiegmans A, Chenevix-Trench G, Khanna KK, Lakhani SR, Smart CE. 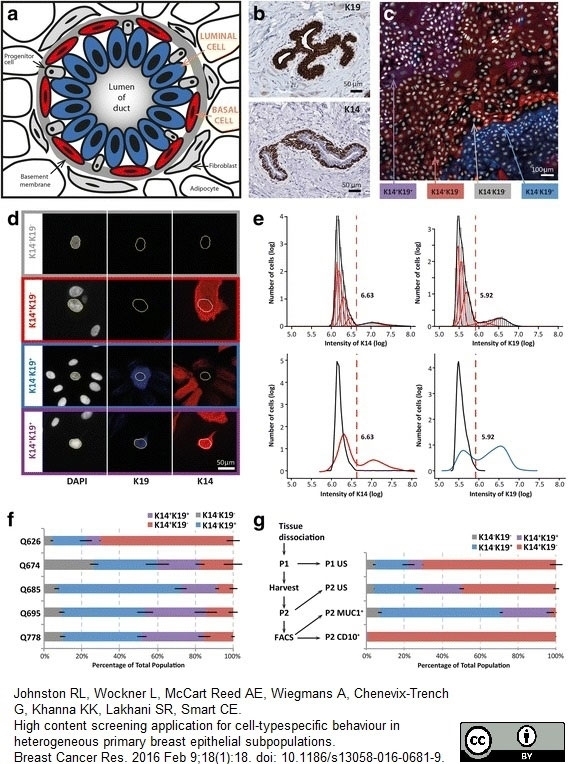 High content screening application for cell-type specific behaviour in heterogeneous primary breast epithelial subpopulations. Breast Cancer Res. 2016 Feb 9;18(1):18. Mouse antiHuman cytokeratin 19 antibody, clone A53-B/A2 (5552-9009) used for the identification of CK19 expressing cells and tissues by immunofluorescence. Mouse antiHuman cytokeratin 19 antibody, clone A53-B/A2 used for the identification of CK19 expressing cells and tissues by immunofluorescence. Mouse anti Human cytokeratin 19 antibody, clone A53-B/A2 recognizes the rod domain (aa 312-335) of human cytokeratin 19 (Böttger; et al. 1995) also known as keratin 19 encoded by the KRT19 gene. Cytokeratin 19 is a 400 amino acid intermediate filament protein lacking a C-terminal tail domain, in contrast to all other intermediate filament proteins. Cytokeratin 19 expression is observed in striated muscle where it is involved in forming the association between the contractile apparatus and dystrophin (Stone et al. 2005). 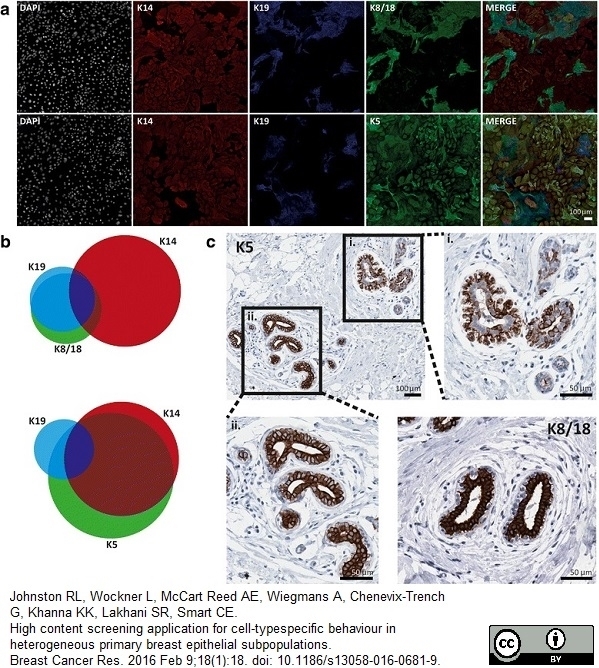 Expression is also seen in many ductal and glandular cells together with a restricted set of normal and neoplasic epithelial cells. Mouse anti Human cytokeratin 19 antibody, clone A53-B/A2 detects a band of ~45 kDa in western blotting using an A-549 human alveolar adenocarcinoma cell line lysate. Human breast cancer cell line MCF-7. In Western blotting 40 kD and 19 kD bands are observed. Karsten, U. et al. (1985) Monoclonal anti-cytokeratin antibody from a hybridoma clone generated by electrofusion. Eur J Cancer Clin Oncol. 21 (6): 733-40. Kasper, M. et al. (1987) Histological evaluation of three new monoclonal anti-cytokeratin antibodies. 1. Normal tissues. Eur J Cancer Clin Oncol. 23 (2): 137-47. Goletz, S. et al. (1997) Novel alphaGalNAc containing glycans on cytokeratins are recognized invitro by galectins with type II carbohydrate recognition domains. J Cell Sci. 110 ( Pt 14): 1585-96.
de Neergaard, M. et al. 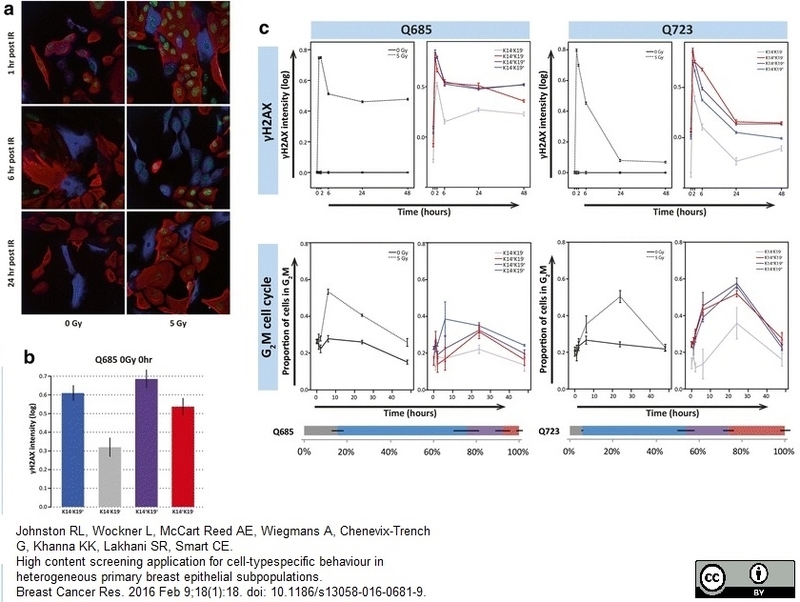 (2010) Epithelial-stromal interaction 1 (EPSTI1) substitutes for peritumoral fibroblasts in the tumor microenvironment. Am J Pathol. 176: 1229-40. Ehlicke, F. et al. (2010) Intervertebral disc regeneration: influence of growth factors on differentiation of human mesenchymal stem cells (hMSC). Int J Artif Organs. 33 (4): 244-52. Johnston, R.L. et al. (2016) High content screening application for cell-type specific behaviour in heterogeneous primary breast epithelial subpopulations. Breast Cancer Res. 18 (1): 18.